Most of us try to fight those feelings - we strive to appear perfect. But in a powerful new vision Dr. Brené Brown challenges everything we think we know about vulnerability, and dispels the widely accepted myth that it's a weakness. She argues that vulnerability is in fact a strength, and when we shut ourselves off from revealing our true selves we grow distanced from the things that bring purpose and meaning to our lives. Brené Brown, Ph.D., LMSW is a New York Times bestselling author and a research professor at the University of Houston Graduate College of Social Work. Her groundbreaking work was the subject of a PBS special, and has been featured on NPR and CNN. Her 2010 TEDx talk on the topic of vulnerability went viral and has been translated into 38 languages. Brené is also the author of The Gifts of Imperfection and I Thought It Was Just Me (but it isn't). 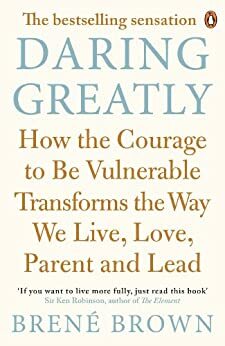 Daring Greatlyis the culmination of twelve years of groundbreaking social research across the home, relationships, work and parenting. It is an invitation to be courageous; to show up and let ourselves be seen, even when there are no guarantees. 5.0 out of 5 starsSo powerful!! This book was filled with so many insights and brought things to the surface for me that I didn't even know were there! Brene is an incredibly researcher and a beautiful writer! I would recommend this book to absolutely everyone! 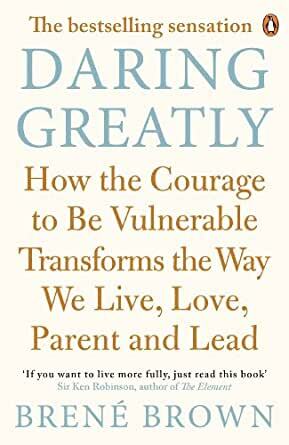 The freedom that came from Brene Brown's Daring Greatly is a marvelous gift, that Have, am, will give and recommend to all people, because it is relevant to all people, of all ages and cultures. Daring Greatly is a magnificent gift to mankind. Helping to guide the World to a more open, accepting, confident, innovative and extordiary place, that it is destined for. I would put this book in my TOP 5 off all time, it is a definate MUST READ. This is full of what my family calls "truth bombs", because it blasts away through the stories you tell yourself and shows the underlying mechanisms of those beliefs. It's uncomfortable reading at times, often confronting... but, as you'll learn in this book, that's the whole point. At the same time, it's so inspiring, because Brené is so relatable. I just love Brene! She speaks the truths most people dare not even acknowledge and then encourages you to rethink your position and become braver, more daring. A thought provoking book with some clear and different definitions of concepts such as guilt, shame and vulnerability. Some good strategies to try and a helpful exploration of the things that hold us back in life. 5.0 out of 5 starsA must-read for everyone! Reading this book has had me see how much shame has run my life, and the lives of our whole society. It is a must read because, until you can honestly accept that shame has an impact on your life, you can have no power over it, and it will be influencing your actions without you know. This book is the access to 'Daring Greatly' in your career, relationships, family...whatever is important to you. Enjoy! It was a page turner. Some good ideas & perspectives. Nice & easy to digest information & stories were entertaining & relatable. Reaffirms the principles stated by Brene in other books/ forums / talks.